OBJECTIVES: The study investigated whether wood usage by informal food vendors and household residents in Cape Town results in the absorption of arsenic (As), chromium (Cr) and copper (Cu) owing to release of these metals in the burning of chromated copper arsenate (CCA)-treated wood. METHODS: The participants (N=78) selected included an equal number of food vendors and non-vendors from 2 informal settlements. All participants answered a questionnaire concerning exposure and were tested for urinary Cr, Cu and As, while the urine of 29 participants was also tested for toxic As (As(tox)). RESULTS: Multivariate analysis showed that the time spent in close proximity to the wood, as well as the quantity of wood used for cooking and for household use, was weakly positively associated with urinary levels of As, Cr and the sum of As, Cr and Cu. CONCLUSIONS: The study provides evidence that use of wood likely to contain CCA as a fuel for informal food outlets and household purposes may increase the absorption of inorganic As, Cu and Cr. A previous investigation indicated that the use of wood treated with chromated copper arsenate (CCA) as a fuel for open fires in street cooking in Cape Town posed a potential public health risk. In this study, CCA-treated wood samples were taken from wood used for informal catering activities, with treated wood being more prevalent in urban townships than in peri-urban areas of Cape Town. Subsequently, the present study was undertaken to investigate exposure to CCA-treated wood and measure urinary levels of arsenic (As), chromium (Cr) and copper (Cu) among informal food vendors and household residents in an urban and peri-urban area in the Western Cape. The first part of this study (described in a manuscript currently under review by the South African Journal of Science) found that urinary As, Cr and Cu levels were not significantly different in the 2 areas and among caterers and household residents, after controlling for confounding, but revealed evidence of Cr and As exposure. Urinary Cr and As in both informal caterers and household residents exceeded the environmental exposure limit in 12% and 30% of participants respectively. Additionally, a toxic form of As was detected in 30% of 29 samples analysed; in 21% the environmental exposure limit was exceeded. Exposure to As, Cr and Cu from CCA-treated wood occurs through inhalation of fumes and dust released on combustion of the wood; contact with wood, ash, contaminated water and soil; and ingestion of contaminated water, food and soil. The toxic forms of these elements are Cr (IV), As (III) and As (V), and Cu (II). The toxic forms of As and Cr are known carcinogens at low doses, and are associated with several non-cancerous conditions, while long-term exposure to Cu (II) is associated with respiratory effects. The aim of this study was to investigate the relationship between firewood and urinary levels of Cr, Cu and As. A cross-sectional study of 78 adult street food vendors and household residents from 2 informal settlement areas in Cape Town was conducted. Exposure assessment was based on a short questionnaire and urinary levels of As, Cr and Cu. The questionnaire contained sections on demographics and lifestyle, use of wood during commercial and home cooking (number of hours per day, days per week, quantity and size of container drums), and recent fish consumption. An experienced and trained research assistant collected spot urine samples from participants in plastic containers with plastic caps. Urine samples were delivered to the Ampath N1 City Hospital Laboratory in Cape Town whence they were transferred to their main laboratory, accredited for analysis of As, Cr and Cu (South African National Accreditation System), in Gauteng. Total Cr, Cu and As (As(tot)) was measured in all samples using high inductively coupled plasma (ICP). Additionally, all samples with total As >20 µg/l were analysed for speciated As including arsenobetaine, arsenite, monomethylarsonic acid (MMA) and dimethylarsinic acid (DMA) and arsinate using high-pressure liquid chromatography (HPLC), and ICP with mass spectrophotometry (MS) analysis. As(tox) was calculated as the sum of arsenobetaine, Ai (arsenite + arsenate), MMA and DMA. Urinary Cr, Cu, As and As(tox) concentrations were adjusted for urinary creatinine concentrations. A zero value was allocated when no metal was detected. Urinary concentrations of Cr, Cu, As(tot) and As(tox) adjusted for urinary creatinine as well as the sum of these metals were the primary outcome variables analysed both as continuous variables and as dichotomous variables with cut-offs > the detection limits for the metals and > environmental exposure limits for the metals. The number of hours and quantity of wood (litres) per week specifically used for catering and for household purposes, as well as the total for both purposes, were the primary exposure variables analysed as continuous variables. Univariate and bivariate exploration of the data was performed. Multiple linear regression analysis and logistic regression analysis were performed for the relationships between outcome and exposure variables, adjusting for potential confounders. Confounders were selected on an a priori basis, according to biological plausibility, or using bivariate testing if association with outcome was significant (p<0.1). Data were entered and analysed using Stata 8. The study was conducted in accordance with the recommendations outlined in the Declaration of Helsinki, and the proposal was approved by the University of Cape Town's Research Ethics Committee (reference 286/2011). Demographic and lifestyle details of the 78 participants who produced a urine sample are shown in Table 1. Vendors were all employed while the majority (63%) of household residents were unemployed. Less than 25% of participants had matriculated; one had tertiary education. About a third of the participants had smoked in their lifetime, and more than half consumed alcohol. There was no statistical difference in the median age of the caterers (median age 38, interquartile range (IQR) 26 - 48 years) and that of household residents (median age 35, IQR 23 - 54 years). Virtually all (95%) vendors operated only one braai-stand. Most participants, and household residents in particular, used wood 7 days per week (Table 2). Both the number of hours per week and the quantity of wood used per week were significantly higher among vendors. The number of hours spent cooking, and the quantity of wood used, was significantly (p<0.05) greater among the 29 participants (median quantity of wood in litres 360, IQR 175 - 3 600; median hours 56, IQR 35 - 72) whose urine was analysed for As(tox) than the remaining participants (median quantity of wood in litres 350, IQR 175 - 1 400; median hours 42, IQR 21 - 56). The Cr, Cu and As urinary levels among participants are described in detail in the previous paper. Table 3 shows that detection and median levels of Cr, Cu and As among household residents and caterers were similar, but that those exceeding the Cr and As(tox) exposure limits were higher (although not statistically significant) among household residents. Of the 30 participants who reported eating fish in the previous 3 days, 28 (93%) reported 1 such meal; the other 2 participants reported 2 and 3 meals. More household residents than caterers reported eating fish in the 3 days prior to testing. 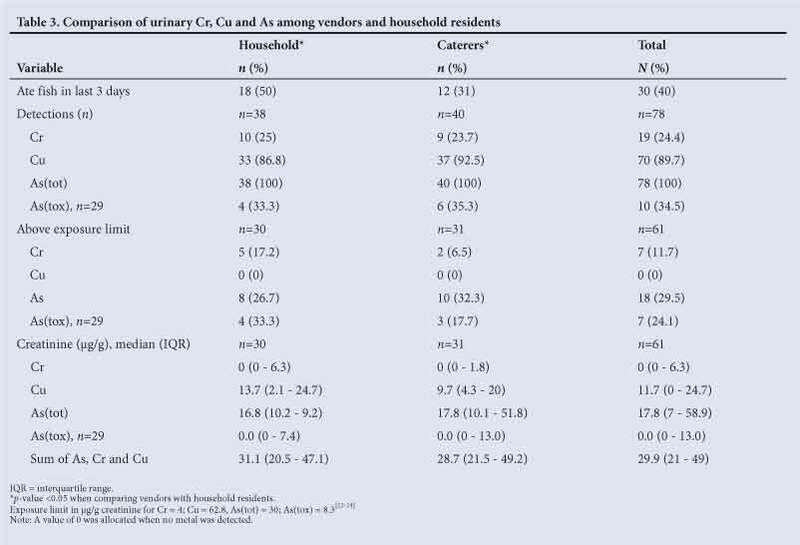 The sum of urinary Cr, Cu and As levels was not different among household residents and caterers. Multivariate analysis showed that the time spent on using wood, and the quantity of wood used, either specifically for catering and/ or household use, were weakly positively associated with urinary As(tot) levels and As(tot) levels that exceeded the exposure limit once controlled for confounding (Table 4). When urinary Cr was detected, Cr levels and those exceeding the exposure limit were weakly positively associated with wood usage. The sum of urinary As, Cr and Cu levels was weakly positively associated with wood usage. As(tox) levels were also weakly positively associated with the number of hours and total quantity of wood used. As(tox) levels were inconsistently associated with wood usage when specifically used for either catering or household use. Urinary Cu was also inconsistently associated with wood usage. As mentioned, urinary levels of As(tot), As(tox) Cr and Cu were not found to be different among caterers and non-caterers in the first part of the study. To our knowledge, this is the first study of Cu, Cr and As absorption resulting from burning of CCA-treated wood by street vendors in informal communities in Cape Town. While the quantity of CCA-treated wood usage was greatest amongst vendors, the levels of As, Cr and Cu were not different when food vendors and household residents were compared. The consistent positive association of wood exposure (time spent and total amount of wood used) and urinary levels of As(tot), Cr as well as with As(tox) and the sum of urinary As, Cr and Cu, indicates that exposure to CCA-treated wood could result in absorption of these metals. Confounding factors were controlled for in the analysis. Regarding these, fish consumption is particularly important as eating fish was strongly associated with As(tot) levels in the previous study. The amount of fish consumed is unlikely to have affected results in this study since 28 out of 30 participants who had consumed fish in the 3 days prior to testing, had eaten only 1 fish meal. The absence of an association of Cu with wood usage could be explained by exposure to Cu not being measurable in the study; exposure to this metal is common among household residents and workers. Other exposure to Cr and inorganic As[7,8] is also probable but would have been unlikely to have correlated with wood usage. The small sample size could account for the non-significance of the association between wood usage and urinary levels of As and Cr. As levels in this study were higher in CCA-treated wood-exposed than non-exposed persons, but substantially lower than those measured in timber CCA treatment plant workers and other As-exposed industrial workers. It is difficult to comment on the long-term consequences of As and Cr exposure at the levels measured in this study; few epidemiological studies exist that have investigated the health effects at these levels of exposure. The cross-sectional design of the study is a further limitation. Additionally, self-reporting of wood usage might not have been accurate. Regarding this latter point, participants could not report accurately whether they had used wood with the green tint characteristic of CCA treatment. Another possible limitation arises from selection of urine samples for further analysis for As(tox) based on As(tot) levels exceeding 20 µg/g creatinine rather than on quantity of wood used. Nevertheless, wood usage among participants whose urine was sent for As speciation was significantly greater than among the other participants. The present study provides evidence that use of wood likely to contain CCA-treated timber as a fuel for informal catering and household purposes may increase the absorption of inorganic As and Cr among the Cape Town communities studied. Exposure to CCA-treated wood can potentially contribute to health problems in such informal settlements, which are already recognised in developing countries to be particularly vulnerable. A larger study, having a longitudinal design, would more accurately investigate whether use of CCA-treated wood does indeed lead to increased absorption of inorganic As and Cr and result in adverse health effects. Interventions to prevent the use of CCA-treated wood in informal settlements, and environmental monitoring in these areas, are required. Acknowledgements. We thank the UCT Vice-Chancellor's Strategic Fund, UCT Research Committee and National Research Foundation for their financial support for this study. We extend special thanks to the participants and community development workers from Langa and Kayamandi (Stellenbosch) for arranging access to the study areas.